Microsoft’s Windows 10 April 2018 update is ready for download from today. Those who are on Windows 10 will find the update automatically installed on their PCs, laptops. So what will Windows 10 April 2018 update add to the operating system? Here’s a quick look at the top new features. The Timeline feature will appeal to those who have data on multiple devices and find it tough to manage their files across devices. Timeline will make searching for emails, file folders, photos and videos a lot easier. Microsoft says, “Timeline can help you get back this wasted time,” spent on trying to locate documents or photos. Timeline will let the Windows 10 PC go back in time up to 30 days to find the required files. Microsoft says this will work whether a user was working on the file one day back, a week before or even a few weeks ago, though the limit is 30 days. Pressing the timeline option will show files, tabs from earlier today, week back, etc as seen in the image below. Users who are signed into their Microsoft account on Android and iOS can even pick up from the file they had opened on these devices, when they return to the Windows 10 PC. This is limited to those who are logged into their Microsoft Account on the Android/iOS phone or tablet. For example, if you were working on a document during your commute to work on your phone, you will be able to find it on your desktop as well and pick up from where you left off, thanks to the Timeline feature. The Timeline feature will appeal to those who have data on multiple devices and find it a bit tough to manage their files across devices. Think of this as DND for the desktop or your PC without any social media alerts to disturb you while at work. Microsoft explains that the reason for Focus Assist is to help users who find themselves distracted thanks to a flood of notifications. “Today, most of us spend between 3-6 hours – each day – on screens. Much of this time is spent on social media, where the constant stream of distractions across our myriad of devices makes it hard to focus,” explains Microsoft’s blog. The blog adds that the average person needs about 23 minutes to regroup after being interrupted. However, turning on Focus Assist will ensure that these distractions are reduced. So social media alerts, be whether your favourite YouTuber has uploaded a new video, or the fact that your friend checked into a new location on Facebook, will be turned off when ‘Focus Assist’ is activated. Microsoft explains that the reason for Focus Assist to help users who can often themselves distracted thanks to a flood of notifications. Users can also set Focus Assist to turn on automatically at certain times during the day when they want no distractions. Microsoft says when the user finishes, they will get a summary of what alerts came, be it notifications, emails or updates. Focus Assist will also let users keep certain people out of this feature. For example one can ensure that mails or pings from their boss still come through, even when Focus Assist is turned on. 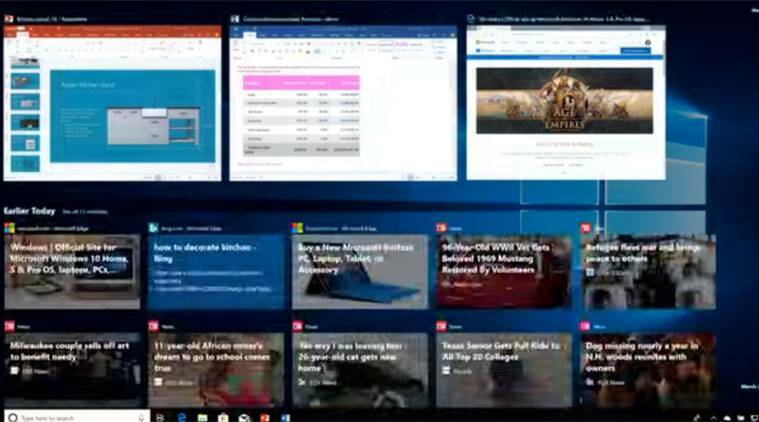 Microsoft Edge will also get new features to help users focus while browsing the web. There will be a new audio icon to mute and unmute a tab that is playing sound. When reading a book or a PDF on Microsoft Edge, the Reading View mode will ensure that pages can go full-screen. This will help with a “distraction-free reading experience”, says the company. The new update will also bring changes to Dictation feature on Windows 10. This will make it easier to take notes, etc using voice. Microsoft Edge will also save address, payment and other information securely. It will also allow for printing web pages in a cleaner format with the new clutter-free printing option. The Edge browser will also get a new ‘Grammar Tools’ button to help users with comprehension aids. This will break words on the page into syllables and highlight different parts of speech such as nouns, verbs, and adjectives. The new update will also bring changes to Dictation feature on Windows 10. This will make it easier to take notes, etc using voice. Users can activate this by pressing Win+H and start talking once the mic symbol appears. Microsoft says Dictation in Windows 10 has been improved, and it can quickly and accurately capture what the user is saying. Also Cortana, the digital voice-assistant on Microsoft’s Windows 10, will now manage smart home devices from the PC itself.